Here we have two tricks to a Homemade McRib. If you’ve ever grown frustrated that the world’s biggest restaurant can’t find ONE little minced processed pork sandwich (It’s for a LIMITED TIME ONLY. 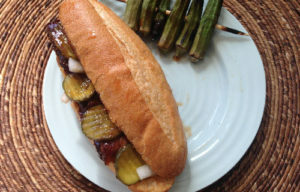 Ugh) then this Homemade McRib experiment may interest you. 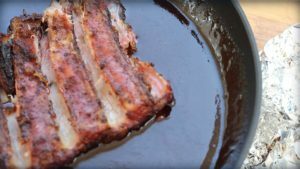 We tried out a little trick or two to prepare a homemade mcrib – by removing the bones of a half slab of pork ribs. It works like a charm. Back in 1981 when all the fast food places just had burgers and – Micky d’s introduced the specialty. It was dropped 1985 because it wasn’t selling. 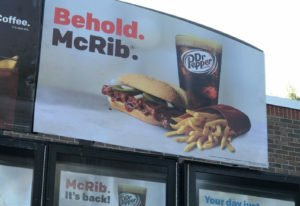 It came back in 94, the fast food behemoth tried again and found greater success with the McRib. In 2005 they started the whole limited time only thing – a tactic that works! 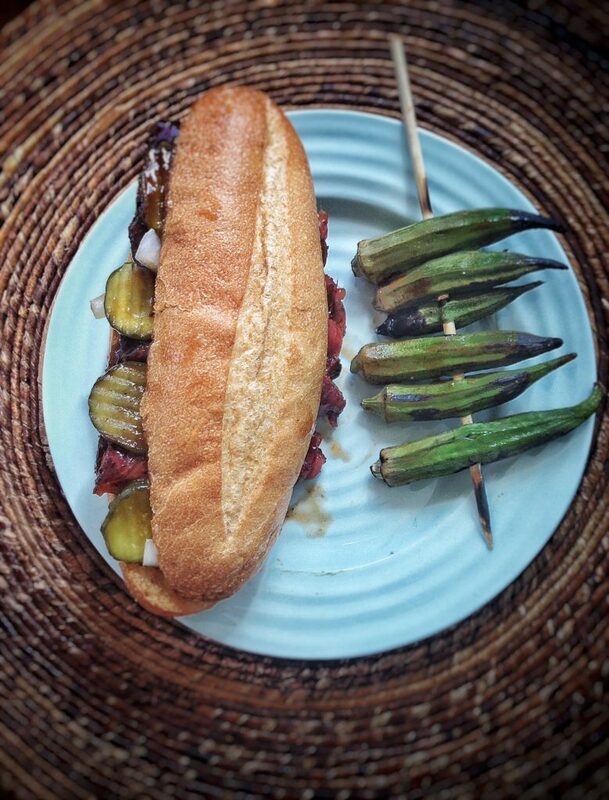 The store version is said to posses 70 different ingredients, the least innocuous of which are “pig bits like tripe, heart, and scalded stomach.”So here’s the trick to not only enjoying a boneless rib sandwich or Homemade McRib at home tricks that make the hand held half rack even better with simpler ingredients. I have to note – I’m in what I will claim as the birthplace of the McRib: Charleston, SC. Here’s why: McDonald’s Executive chef,Rene Arend, (at the time) has said he was visiting / traveling in the LowCountry of the palmetto state the city and had some BBQ sandwiches – usually pulled pork around here and he thought the flavors would work. So yeah – it all started here. Bragging rights. Peel the membrane off the bone side of the slab by loosening the tough tissue at one end with a blunt knife and then grasping with a dry grip of paper towel. The trick is being able to grasp as much of the membrane end at once. It may take two peels but should come of clean. Next, gently score the surface of the slab where the bones meet the meat. Use a sharp knife tip as shown in the video. Trim the membrane close to the bone to give the “fall off the bone” process a helping hand. This will allow the bones to “fall off the meat” or vice versa. You want to get the meat to pull away from the bones but not totally fall off and break apart. Divide the slab into two halves and smoke at 300 degrees Fahrenheit for 90 minutes. Or use the 3-2-1 method. Cook an additional one to two hours at 300 degrees until bones protrude at the ends. Add sauce and grill on high heat to char (preferred method) or dredge in sauce (traditional method) and place on toasted roll. Add slivered onions and hamburger dill pickles. Another fun fact – did u know there were three McRib Farewell Tours, in 2005, 2006 and 2007. – now you no longer need to fear the limited time… make it at home. When you're out of McDonald's Limited time you can turn to this trick for de-boning your ribs for a succulent BBQ sandwich. Next, gently score the surface of the slab where the bones meet the meat. This will allow the bones to “fall off the meat” or vice versa. You want to get the meat to pull away from the bones but not totally fall off and break apart. Add sauce and grill on high heat to char (preferred method) or dredge in sauce (traditional method) and place on toasted roll. Add slivered onions and hamburger dill pickles. Combine all ingredients in a mixing bowl and blend thoroughly with forks, slotted spoons, or fingers (eliminating all lumps). An oyster roast is a special thing. But what exactly is an oyster roast? It’s different from fire roasting oysters. In coastal America friends gather during the “R” months and shake off a bit of a winter chill over a steaming hot table of oysters. Nothing fancy. It’s just oysters (sometimes a bit of grit and mud if you’re really authentic) some hot sauce, saltines, and cocktail sauce. Roasting is usually fire, meat and char, right? 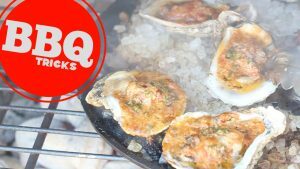 You can add the “roasting” back into the cook by preparing your oysters on the half shell first and then add a dollop of specially prepared savory compound butter (recipe below). Shell your oysters being careful to retain as much “liquor” as possible. Loosen the meat and keep in the half shell. Keep your oysters stable by nestling them on a bed of rock salt (ice cream salt was most readily available) in a large cast iron skillet. You can try to rest the shells directly on the grate but it may be a balancing act with unevenly shaped shells. Using fresh oysters on the half shell (shuck them by inserting the tip of the oyster knife into the joint end of the shell fish and twisting the blade. Try to keep as much of the briney liquid (also called liquor) in the bottom shell with the loosened oyster meat. 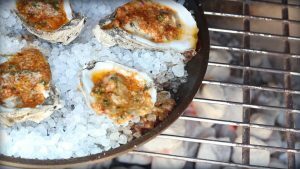 Top with a dollop of compound butter and heat shell side down over live fire or coals until edges brown and liquid bubbles. Mix butter and ingredients other than the oysters in a bowl. Top each oyster with a tablespoon of butter mixture. Heat over live flame utilizing coarse salt in a cast iron pan to stabilize. Once sizzling hot top with additional parsley for garnish.